Clicking the two pictures above will bring up the training PDF and packing advice PDF respectivly. 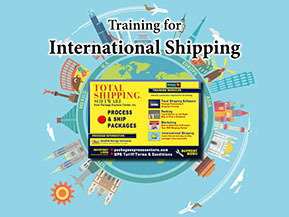 The training PDF will lead you step by step through shipping package in our software and all the menu components. The packing PDF shows you the correct way to package to avoid unnecessary claims. If you have any questions that the two PDF modules do not cover please do not hesitate to call. Clicking the two pictures above will bring up the advertising PDF and International PDF respectively. The advertising PDF will assist you in the best ways to advertise and promote shipping in your store to help bring in more customers. International packages are very time consuming and if not done correctly can lead to costly delays. Be sure to review the international PDF before attempting a international package. Fax completed form to 1-800-570-0683 or email completed form to info@packageexpresscenters.com. Links to other useful materials.